Nordic walking is an excellent training for the whole body which can be done easily without much effort. It is for overweight people, in particular, very good as the Nordic walking sticks – also called poles – ease the stress on your joints. 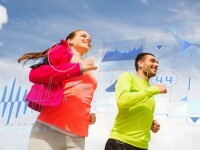 What is more, when done correctly you may burn more calories than when walking without poles. Therefore, it is very important to learn the correct technique and to wear the right shoes to prevent injuries. No matter which sport you chose, it is always important to keep an eye on the correct execution of the technique. Only in this way is it possible to gain the desired training effect and to prevent overuse systems. The right pole touches the ground when the left foot hits the ground – and the other way round. The shoulders are relaxed. Trunk and hip swing steadily in contrary direction. Swing your arms slowly and adapted to the length of your steps. 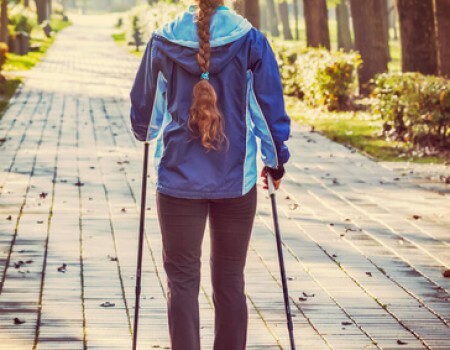 The Nordic walking sticks swing closely to the body forwards and backwards. When the poles hit the ground the hands are closed tightly around the stick handles. At the end of the backward swing the arm is extended and the hands do not grip the poles anymore. This is done to prevent cramps in the trunk and shoulder area. When swinging the poles forwards, the hands close around the handles again and the arms are bent slightly. At the end of the forward swing the poles hit the ground again next to the anterior part of the foot. Hereby the poles are slightly tilted forward. As soon as the arm is behind the hip, the extended arms push backwards. Therein results a feed. In contrast to walking the steps are bigger. The rolling movement of the feet is almost identical. The feet roll from heel to toe. 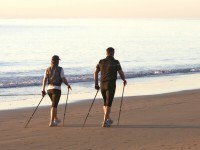 The material of the Nordic walking sticks (poles) is a mixture of carbon and glass fibre. They are light but still very stable when using them. 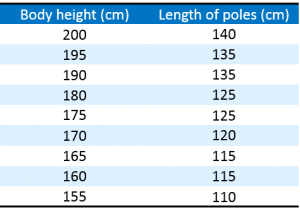 There are two different types of poles: telescope poles which can be individually adjusted to your body height, and not adjustable poles. To determine the right length of the poles, there should be a right angle between upper and lower arm. The length of the poles is about 70% of your body height. If you have shorter poles, your steps will be smaller than with longer poles. At the end of the push-off phase the hands are not open but closed tightly around the handles. The shoulders are tensed up. The arms are not extended backwards far enough. Amble – the left arm and the left foot swing forward. The correct technique would be: the right arm and the left foot swing forward. Start with a fast walk and drag the poles across the ground. The hands are not closed around the handles and the arms are extended. When swinging forwards, your hands close around the handles, and when swinging backwords, your hands open. Obstacles: Look for easy obstacles (twigs, small puddles) you need to overcome. Make sure that you do not lose the rhythm. This exercise will also help you to do larger steps. Use of arms: Intend to put more force into the pole thrust by using your arms more powerfully. When walking uphill, you can use your arms more intensively. Downhill: Lean your upper body back. The poles are held upright when they hit the ground. Uphill: Bend your upper body forward. The poles are also slightly tilted forward. Keep your balance: for the start position stand on one foot, the poles touch the ground next to you. Lift one foot and try to keep your balance. To make it even more difficult you may move the foot that is in the air, close your eyes or lift one or both poles. Then you have to keep your balance without support.